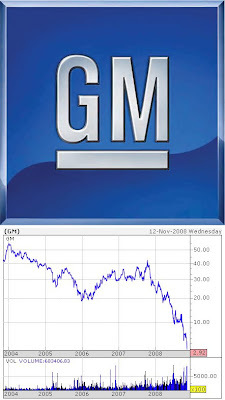 INKSPOT•PROJECT: (Um) "AS GM GOES, SO GOES THE NATION"
That's a famous, old saying from another time. Right? It begs the question: are the wisdom and pertinence of this famous statement equally as antiquated? No doubt, there will be some sort of auto-industry bailout in the near future. It may even be bumped into the 111th congress. But it will happen. It needs to happen. Like it or not. Many are simmering because GM and other U.S. car makers largely brought this upon themselves: poor planning, prioritizing gas-guzzling SUV's instead of focusing on energy-efficient technologies and simply ignoring the writing on the wall. Now they're in line to have Uncle Sam bail them out, again. Many more are chiding, "with all those smart people at the helm of these companies, how could they have gotten it so wrong? Building Escalades and Hummers instead of developing hybrids? Really?" It seems there is very little that Americans won't collectively own by the end of this bail-out frenzy, for better or worse. Sure, it beats the prospect of millions of people out of a job and the too-big-to-fail companies going belly up. At least the Federal government can allow these industries to "work out" of the situation over time. That's right, they call it a "work out." This is the narrative that, at the very least, helps us swallow the many economically bitter pills that are piling up.